Butternut squash is a type of winter squash, with yellowish-tan skin and firm orange flesh. Low in fats and proteins and high in carbohydrates, the vegetable has a mild, slightly nutty flavor and is typically prepared by boiling or steaming. One-half of a typical butternut squash weighs 680 g, on average. According to the U.S. Department of Agriculture, within that portion, approximately 71 g consist of carbohydrates, 6 g are proteins and less than 1 g is fat. The remainder consists of indigestible matter, other nutrients and water. The USDA also states that half a butternut squash, at 680 g, contains a total of 272 calories. Carbohydrates deliver 242 calories within that portion. Proteins provide about 25 calories and fats offer only 5 calories. The same amount of butternut squash can serve as 14 percent of the total recommended intake of calories for the average person per day. This percentage is based on a standard diet of 2,000 calories per day. Butternut squash also provides many vitamins including vitamins A, C, E, B6, thiamin, niacin, folate and pantothenic acid. 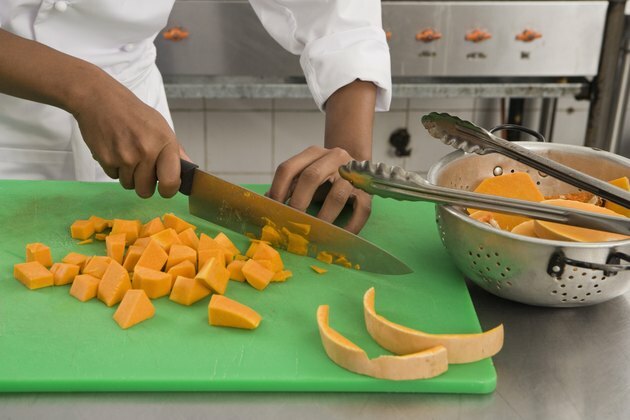 Several dietary minerals are also available in butternut squash including calcium, iron, magnesium, phosphorus, potassium, copper and manganese. How Many Calories Are in Pomegranate Juice? How Many Calories in Tortilla Soup?